LSMacro is a lightweight keyboard macro utility program that allows you to run programs, open URLs, do screen captures, or send key/mouse events to other programs with just a few keystrokes. 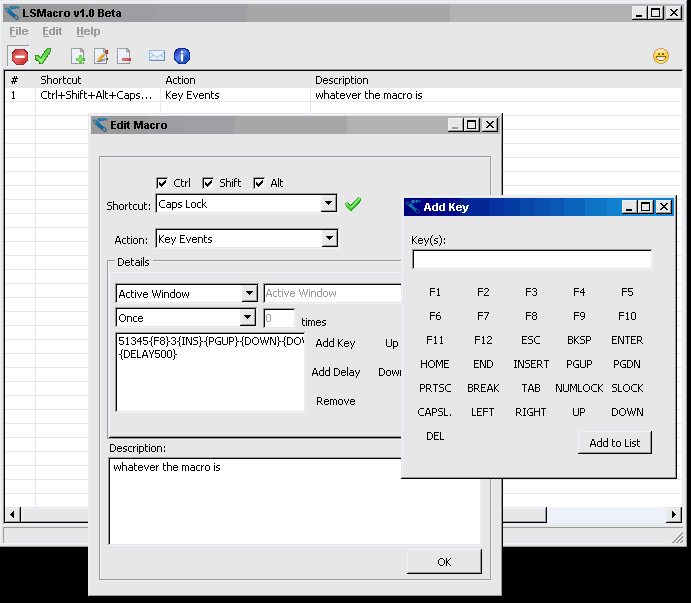 Intuitive and easy to use, remaining in the System tray once macros are defined. Can create macro keys with Control, Shift, or Alt keys. Note: The website is offline, a download mirror has been provided. Writes settings to: Application folder, in macrolist.lis file. How to extract: Download the 7zip file and extract to a folder of your choice. Launch LSMacro.exe. @Midas - Thanks but still confused. I was thinking the note meant that it was being hosted by PFC but the download link goes off into limbo the same way the weblink to the authors site does. (or at least it did when I clicked on it a few days ago). Both the Website and the Download links are dead. Not sure where to find the "direct download". "Note: The website is offline, so I have made it available for direct download. If there was some kind of help it may be a useful program. No details of how to record Macros to start with. I haven't tested this at length yet but already I can tell this is very simple and easy to use compared to many similar automation tools. Great for software testing or speeding up asinine computer tasks.